Have you ever wondered how to get a credit card customer service rep to help you out? Here is some advice about things to do and things to avoid straight from the reps themselves. It goes something like this: You notice an unusual charge on your credit card statement and need to determine if your son or daughter purchased those 20 pink flamingos or if someone gained unauthorized access to your account. Taking the next step of calling customer service is necessary, but not necessarily an enjoyable experience. If many of us were honest, we would admit that calling customer service is akin to sticking a sharp object into our eye. We dread it, and our expectations of a successful call usually aren't high at the outset. And since credit card call center reps say only about 10% of callers are courteous or very courteous, they probably dread your call too. Customers say having to navigate a convoluted and confusing phone menu or holding while listening to someone else's odd musical tastes are a couple of the reasons they dislike calling customer service. 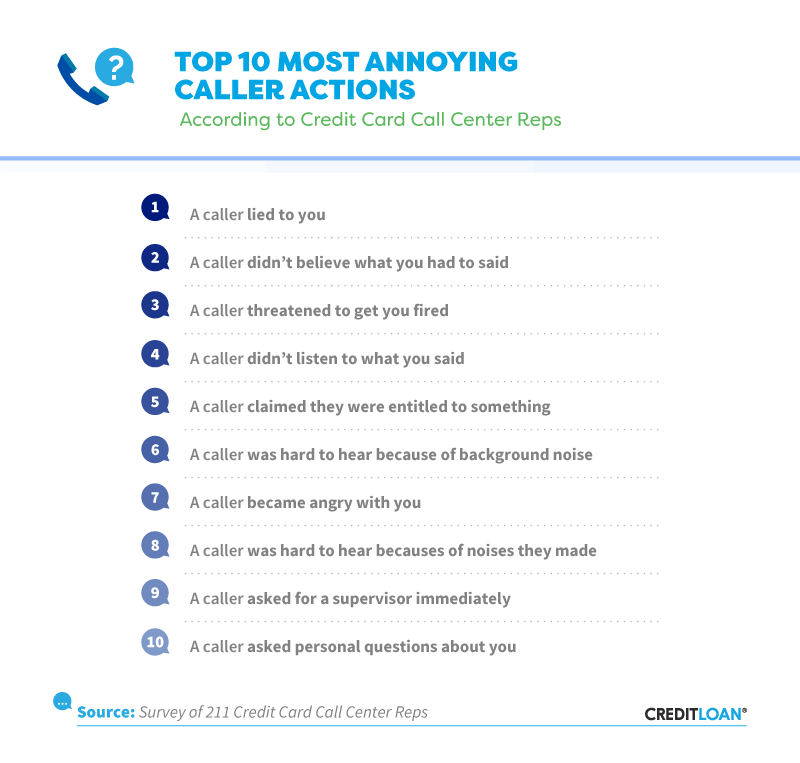 Other reasons could include locating the right number, being passed from person to person, or worse – an unhelpful or unprepared customer service rep.
To get an idea of how customer service representatives (CSRs) feel about the callers on the other end of their headsets, we surveyed 211 reps currently working for credit card companies. Hopefully, the tips and advice they offer will make your next call an enjoyable one. If CSRs believe only 1 in 10 callers are courteous, being nice on the front end will go a long way in how they respond to you. Suffice it to say, being kind when speaking with a customer service rep is a wise and effective tactic. A bit of flattery might not hurt, either. When CSRs were asked what it took for the customer to get what they wanted, being nice was the top response at 59.7%. We'll refer to this as the "be nice" rule. As one CSR eloquently stated, "Be as nice as possible. The people on the phone are not the cause of your problems. Treat them like humans, and they will help you." Another tactic 30.3% of CSRs recommended: Ask for their opinion. Think about it; customer service reps spend hours resolving problems, and what better way to get on a rep's good side than to solicit for their opinion? Consider asking the rep what they would do in the same situation. For the most part, the credit card and financial industry are incredibly competitive, so keeping customers happy is a top priority. That's why 46% of CSRs said threatening to switch banks was a valid tactic for getting your way, as was requesting to speak to a manager. Companies devote significant resources to creating a positive presence on social media platforms like Facebook and Twitter, and when a negative review surfaces, employees tasked with managing social media content spring into action. Even threatening to post a bad review will get a CSR's attention and motivate them to resolve your issue quickly. Strategies that fell near or below the bottom one-fifth included being demanding (20.4%), threatening to contact the media (17.1%), and calling at the beginning or end of the day (14.2% and 9.5%, respectively). 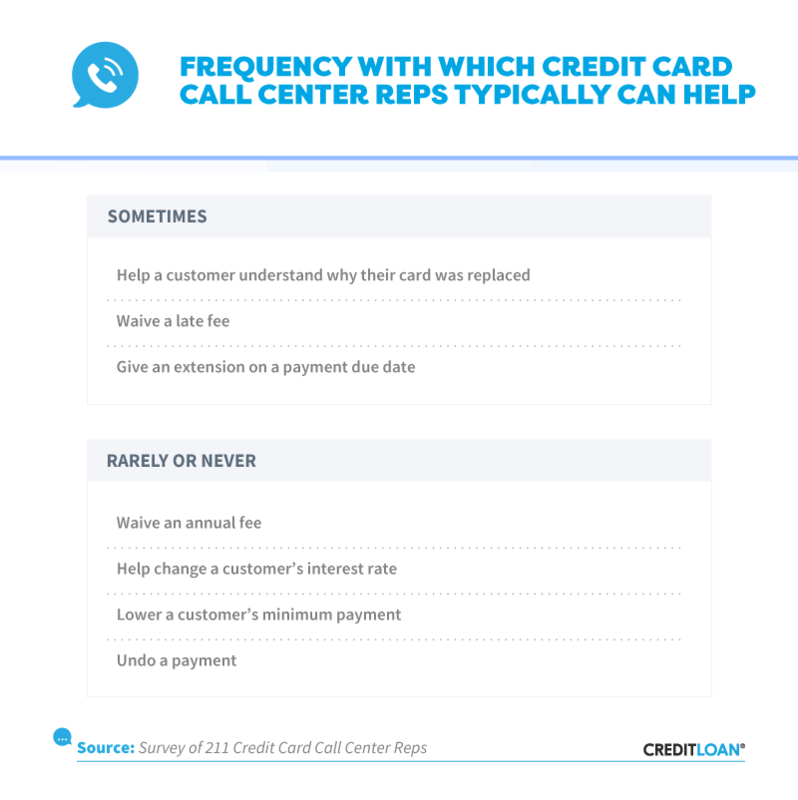 Boiling the credit card call center experience down to the basics is relatively simple. On one end of the call is someone with an issue, question, or concern, and on the other, someone who can hopefully help. We discussed some techniques to help you get the desired result; let's now look at how you can avoid getting on a CSR's bad side. As with relationships and friendships, the fastest method to annoy someone is to lie. It's no different with call center reps – in fact, it was cited as their most egregious pet peeve. CSRs also found it annoying when a caller didn't believe what they said. Imagine a co-worker calls and expresses their displeasure at the response you provided. And, in the heat of the moment, mentions contacting your boss and requesting they fire you. How would you feel? Probably the same as a CSR would if a caller they were tasked with helping issued a similar threat. This ranked as the third most annoying thing a rep could hear. One call center rep confessed they put irritating callers on hold for long periods or conveniently forget how to pass along available discounts. Feeling entitled to something was another way to get on the bad side of a CSR, like when callers are upset and expect the CSR to give them something for their inconvenience. Remember, a better way to get the rep on your side is to be nice from the start. A final word of caution is not to push the boundaries or be too intrusive when speaking with CSRs. Engaging in lighthearted conversation is OK, but one thing reps found annoying was being asked personal questions. A good rule of thumb is not to ask questions over the phone that you wouldn't ask in person. Credit card call center reps are trained to assist with many issues, such as confirming your balance, replacing lost or stolen cards, or even helping you receive credit from a stubborn merchant. But there are also limits to what they can accomplish for you. For instance, some customers may not understand why they received a replacement card. Obvious reasons may include an expired card or fraudulent activity alert provided by someone else that has access to the account. CSR's might be able to assist the customer if they have access to that information, yet others times they may not know why a card was replaced. Call center reps do have access to screens and can read notes or see actions other reps have taken on your behalf, which in most cases is beneficial to both you and the CSR. So, what about that call last winter from a customer who went on a profanity-laced tirade because they were on hold too long? Chances are whoever took that call left a "red flag" note describing the color language they hear. Do you think that might impact how a future CSR treats that same caller a few months later? It's yet another reason to follow the "be nice" rule. Depending on the situation, there are times a CSR can waive a late fee or even extend a payment deadline so that you aren't charged for being tardy. There are other times when a CSR's hands are tied, or they don't have the authority to resolve your dilemma. Requests falling under this category include waiving your annual fee, lowering your interest rate, or reversing a payment. These tasks can only be approved by underwriters or others with more authority than CSRs are given. 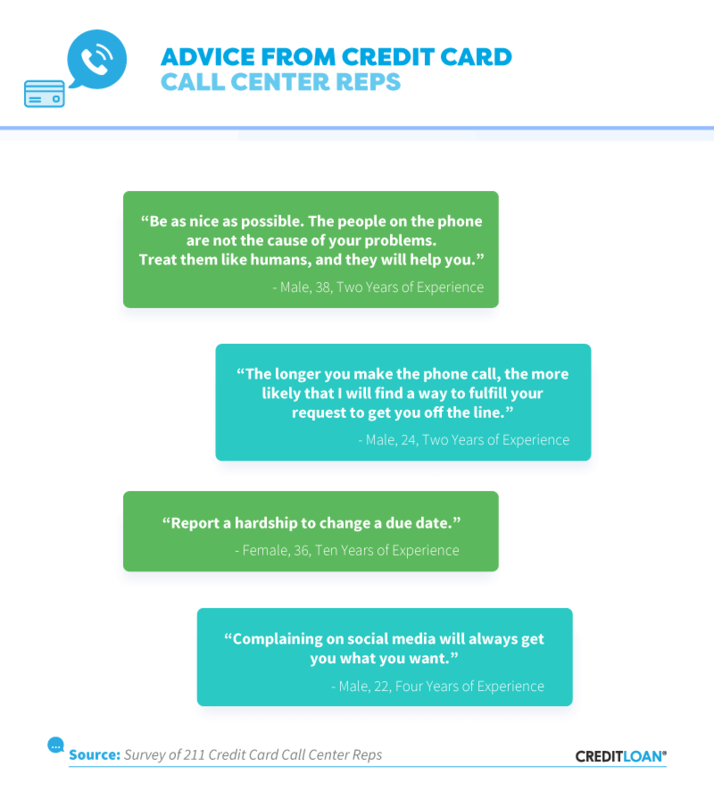 If there is a recurring theme in our analysis of credit card call center reps, it's the "be nice" rule. Besides not extending certain advantages that may resolve your issue, CSRs can put callers in "timeout." Roughly 60% of the reps surveyed transferred difficult callers to another CSR or department. 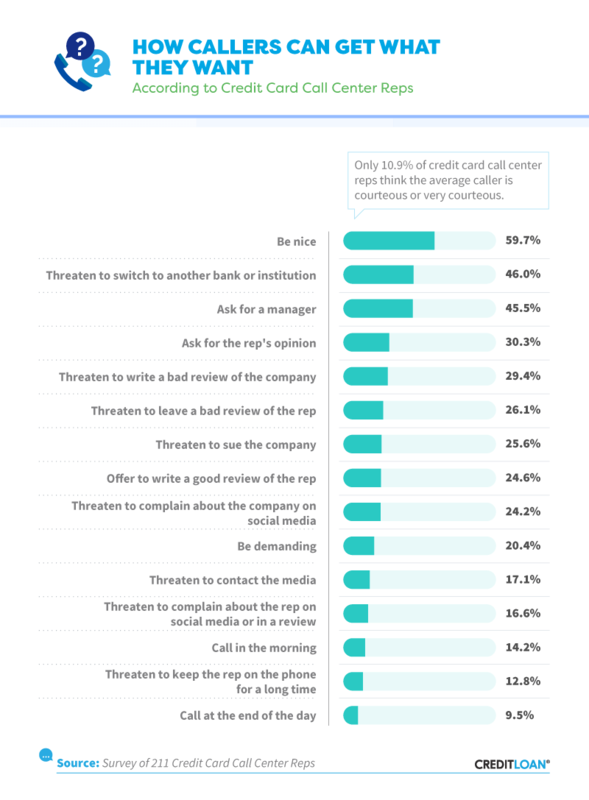 Slightly over 46% said they made a note of a rude phone call in a customer's file (which most likely started them off on the wrong foot with the next CSR they spoke with). 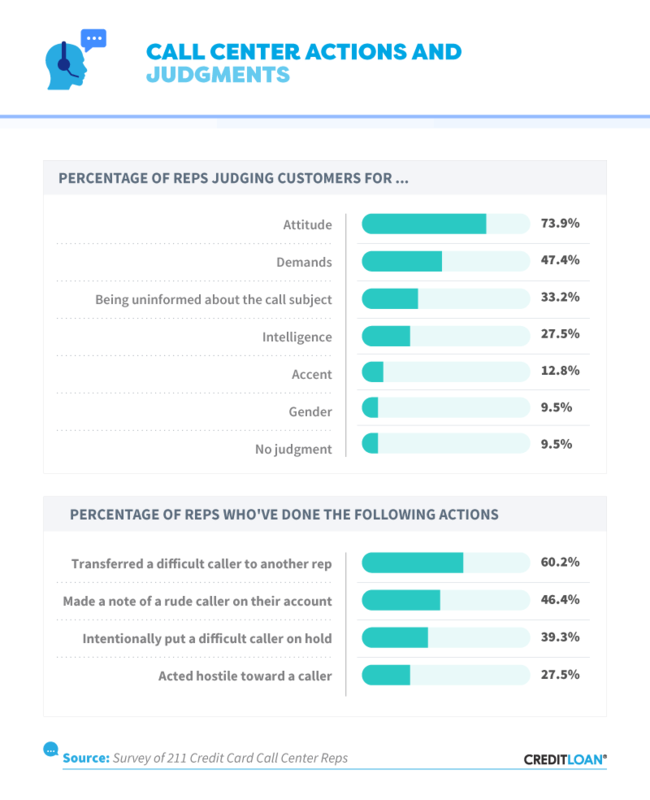 Yet another tactic just under 40% of reps used on difficult callers was putting them on hold, and another 27.5% of reps said they reciprocated by acting hostile themselves. Engaging in a phone conversation with customer service doesn't allow either of you to read facial expressions or make observations about the other person as you would in a face-to-face encounter. 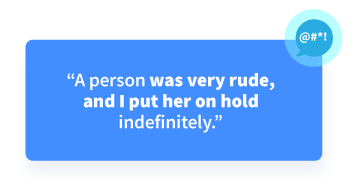 That's why almost three-quarters of CSRs said their first impression of callers was determined by the attitude and demeanor they projected over the phone. Another 47.4% judged callers by their demands. More than one-quarter of CSRs said they evaluated callers by how intelligent they sounded, so choosing the right words or giving the impression that you're informed on the issue will help. Unfortunately, 12.8% said they judged callers by their accents, and another 9.5% said they judged callers by their gender. Roughly 1 in 10 CSRs said they didn't judge callers at all. Interpreting survey results helps us understand what and how people are thinking. But there is no better way to know precisely what CSRs think than to read their direct quotes. Below are some quotes you may find useful. "Report a hardship to change a due date." Chances are you have something in common with many customer service reps you speak with. They might have young children at home or aging family members to care for and can understand why you can't make a payment on time. Giving you an extra week may be one way to demonstrate sympathy for your situation. "Complaining on social media will always get you what you want." Companies are highly sensitive to negative social media reviews. They want to resolve them quickly, possibly even turning a negative review into a positive one. Not to sound like a scratched disc repeating the same phrase, but don't neglect the "be nice" strategy next time you call your credit card company's customer service line. If a rep has dealt with one or more difficult callers, hearing a pleasant and kind voice just might pay huge dividends. Other effective tactics include showing respect and appreciation for the CSR's role, having any relevant information and facts together before placing the call, and, when necessary, being forceful and polite. Remember, if CSRs are dealing with a high call volume, they need to resolve your issue quickly so that they can take care of other customers. We collected survey responses from 211 credit card call center representatives from Amazon's Mechanical Turk. 36.7% of participants were female, and 63.3% were male. Participants ranged in age from 20 to 70 with a mean of 31.7 and a standard deviation of 7.5. We excluded any respondent who did not work in call center customer service for a financial institution. If all or any part of this information is useful to your readers, by all means, please share it with them. All we request is that it be for noncommercial use and that you give credit to CreditLoan for taking the time to produce the content.